For this Take the Time Tuesday, I'm going to do something different. I'd like to share with you some of my friends and family, people I'd be pleased for you to meet in person some day. They are all beautiful people, filled with love. Some of Pure Jeevan's Friends and Family!? 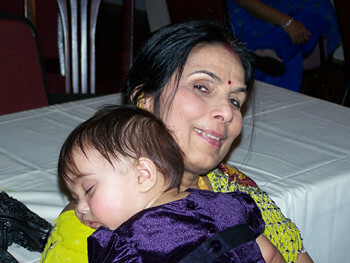 The birthday girl, Rhia, asleep on her beautiful Nani? Jim here... Since many people have asked me how she liked the surprise gift, here's a quick, unedited video taken last Saturday on Wendi's birthday. We had gone to the park that evening to hang out and catch some fresh air. I took a few minutes to ask her about her day, and thought I'd share this with you.If I showed you the video of her receiving the gift that morning, I'm afraid all you'd see would be tears all around the dining room table. (We were all rather emotional about it.) So, take a look at this video for now. Wendi said that she wanted to write something here as well. So, that will no doubt be coming soon. By the way, at the end of this video, Wendi mentions another video of a man we interviewed earlier that day on Wendi's birthday. I was going to edit some of that in, but we decided to run that video here on its own this Thursday because it addresses a question Wendi gets quite often. You'll love that video, as it's a great testament to the power of raw foods. For now, I hope you like the above vid (even though there's a fair amount of dog posterior that I should have edited out - LOL). Read more: Wendi Dee Interviewed About Her 25th Birthday Surprise! Today we'd like to introduce you to one of the sweetest, most creative, and passionate raw foodists we know. She's petite, pretty, pleasant, powerful! She continually shares her knowledge about the raw food lifestyle with others and educates many individuals about our human rights when it comes to the foods we grow and consume. She's up on the latest regulatory activities relating to health and diet issues going on within the US government, and speaks out when our rights are in jeopardy of being taken away. Take the Time to Meet... Rhio!